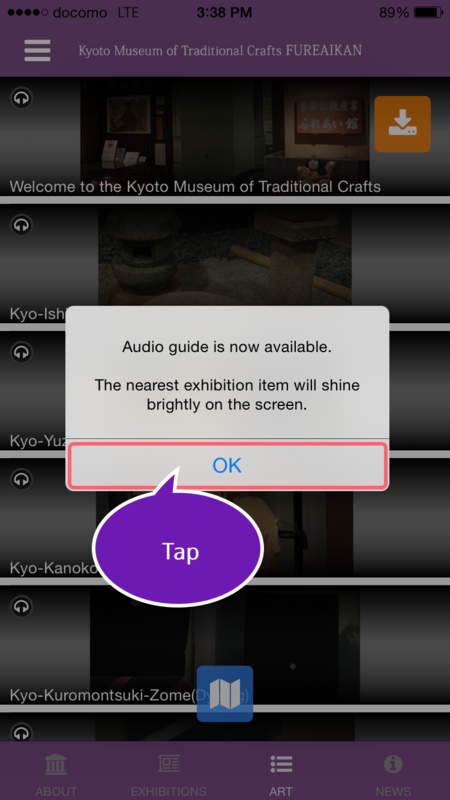 Please download the museum’s free audio guide application from your application store (Apple App Store or Google Play Store). 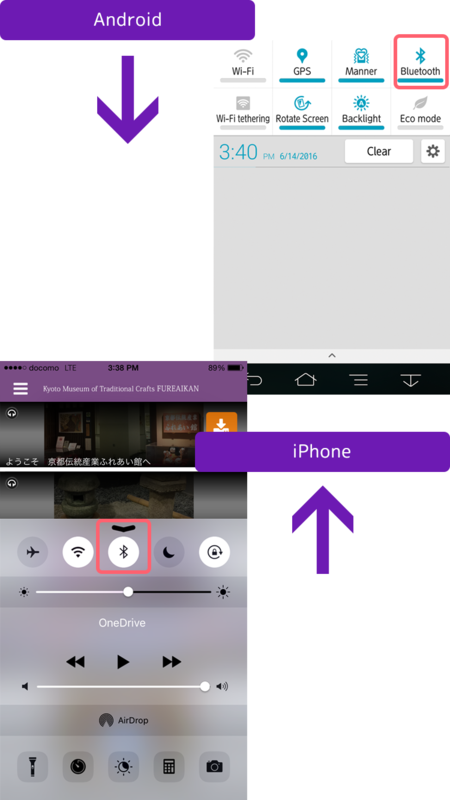 After downloading the application, proceed to the choice of language for the audio guide. Select English. 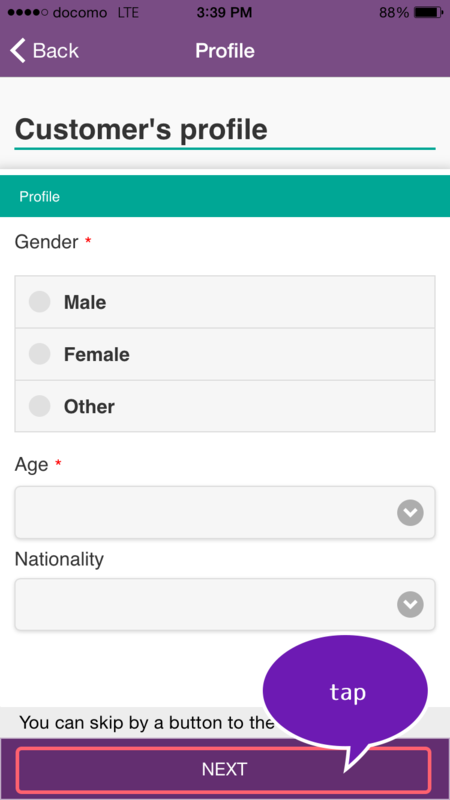 Proﬁle input screen is shown next. Please input your gender, age and country. It is possible to change your proﬁle settings later in the menu (upper left corner of the screen). After the proﬁle input, please download the audio guide data. You need to download the data only once. 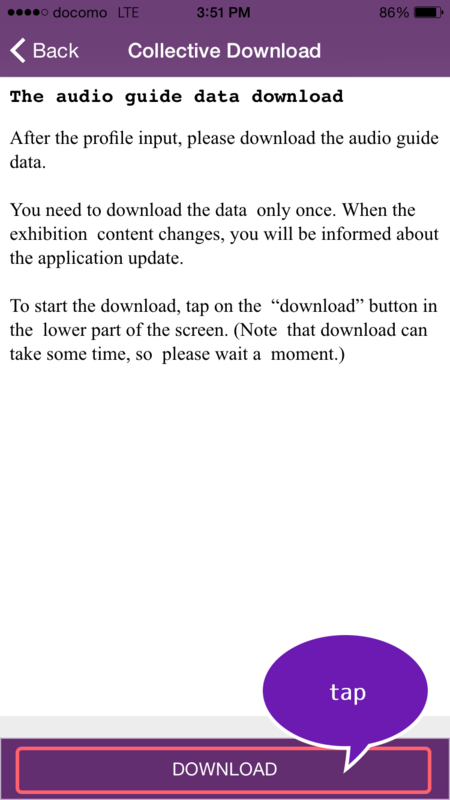 When the exhibitioncontent changes, you will be informed about the application update. ４．Allow the app to use GPS. 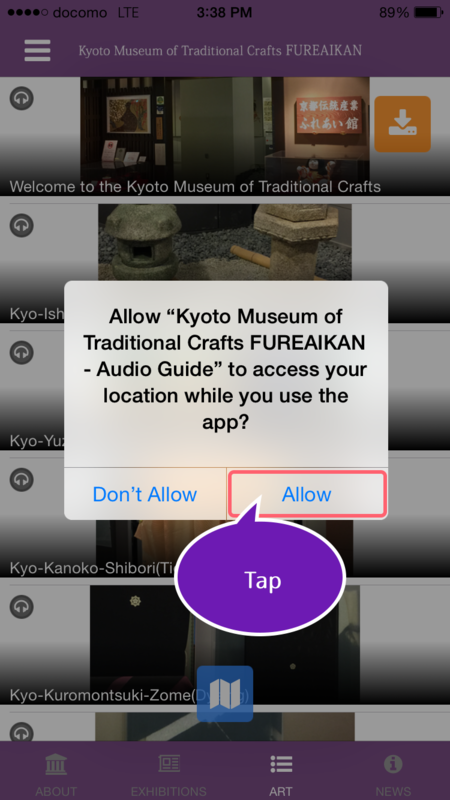 Tap the “Allow” button to permit the app to access your location. 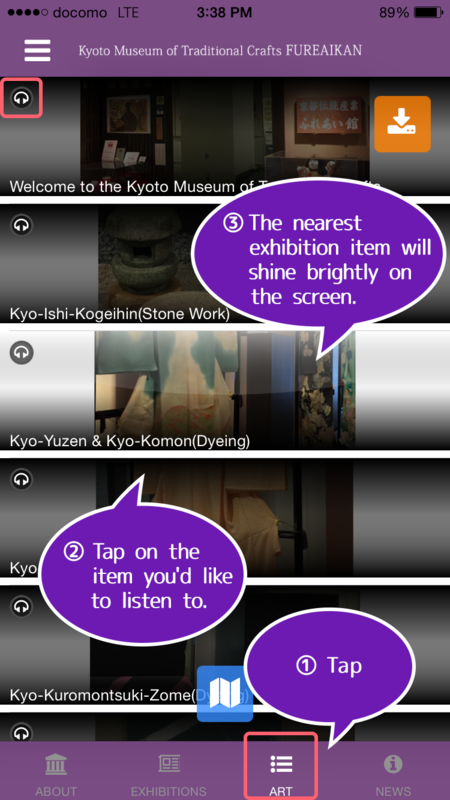 ５．Please check-in at the audio guide at the museum reception desk. Tap “OK” to start using the application. Activate Bluetooth on your smartphone. Swipe the screen from the top to the bottom and tap on the Bluetooth button. Swipe the screen from the bottom to the top and tap on the Bluetooth button. Tap on the item you'd like to listen to. The nearest exhibition item will shine brightly on the screen. The play & stop button is located in the lower right corner of the screen. Stream of subtitles of the voice data runs above the bar. 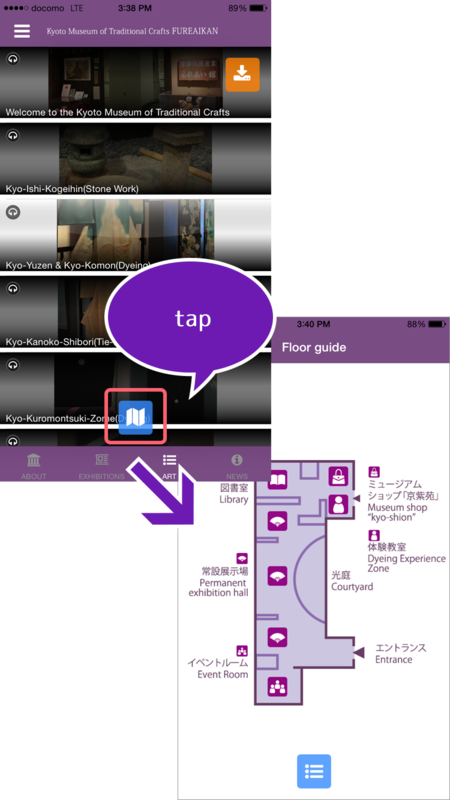 You can check the museum floor map by tapping on the blue icon in the lower part of the screen. 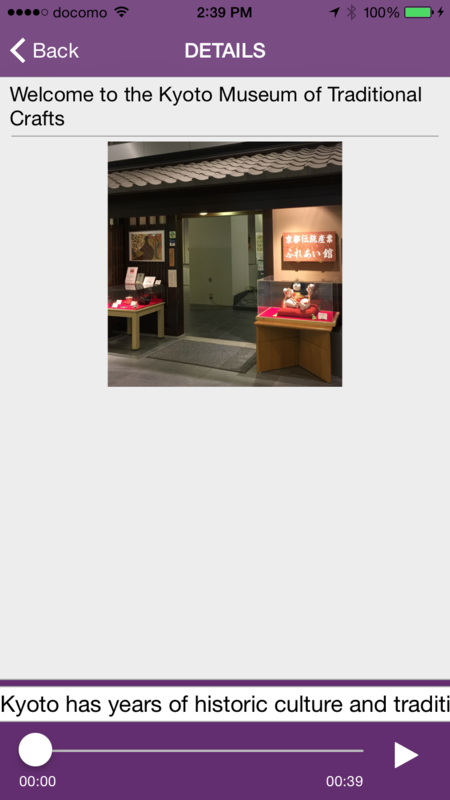 Copyright (c) Kyoto Museum of Traditional Crafts All Rights Reserved. * The names of companies and products mentioned here are brand names with trademark registration. * Please understand beforehand that the speciﬁcations of the products mentioned here can be changed without prior notice.